Today it's a posh, rather touristy restaurant run by a corporation, but a century ago it was the bohemian hangout for the city's artists in the golden age of modernisme. 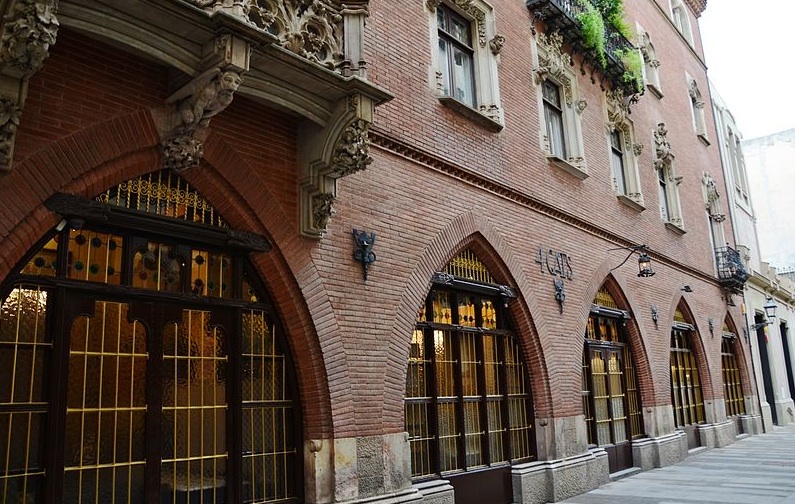 It is located in the Casa Martí (1895), the first building by Josep Puig i Cadafalch, a Modernista fantasy combining elements of Catalan and northern Gothic. Eusebi Arnau sculpted the St George and the Dragon on the corner, a motif that Puig would make his own. Arnau also carved the other sculptures, the coat of arms made of symbols of the textile trade, and the little figures in the vegetation. The building is renowned as the home of Els Quatre Gats (‘The Four Cats’, slang for ‘Just a few guys’, but also recalling the famous Chat Noir in Paris), the bohemian taverna that provided much of the impetus for the city’s cultural life at the start of the 20th century. By the time of Els Quatre Gats, Romeu had abandoned painting to devote himself to cabaret and cycling, and running things in the bar after a fashion, having a screaming fit if anyone touched a cobweb. The food was reputable terrible, and portions minuscule. Nevertheless, tt soon became the seat of Barcelona moderniste cool, an informal late-night meeting place and permanent salon for writers, artists, journalists and musicians, many of whom were subjects of charcoal sketches by Casas and the group's young protegé, Picasso. 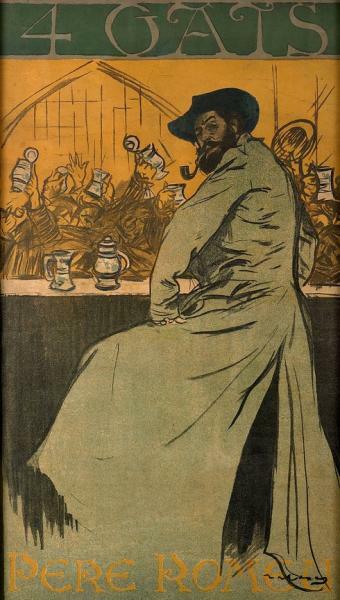 The Quatre Gats published its own art review and held avant garde shadow-puppet shows. Romeu's put on ombres xineses ('Chinese shadows') or shadow puppets, which he hoped would attract children (and their paying parents) but were also handy for satirizing current events and public figures. It also presented recitals by young composers Granados and Albéniz, and put on exhibitions, including the 18 year-old Picasso’s very first, in 1900. Six years later, the place was taken over by Gaudí and Llimona’s pious Catholic Cercle de Sant Lluc, an art group founded in reaction to the blasphemous tomfoolery of Casas and Rusinyol. Today there’s a new Quatre Gats. Instead of cobwebs, there's a painstaking reproduction of the original décor by Puig, with copies of the original paintings (many of which are now in MNAC). The cooking is a melange of Barcelona favourites; local reviews range from great to not-so-hot. In the evening it's way pricey, with a piano player. 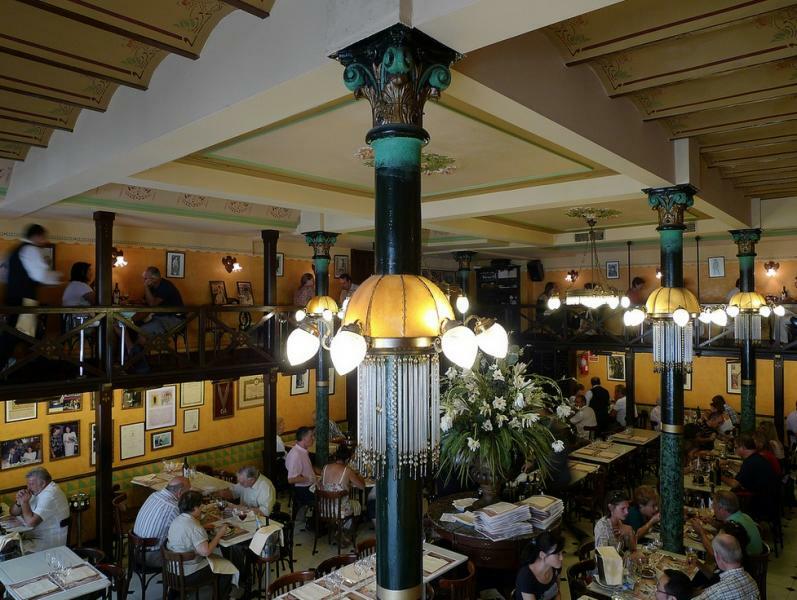 Come for the more affordable lunch menu, and a look at a Barcelona landmark.